14 Sep Top 10 wedding hairstyles you need to know about! Top 10 wedding hairstyles you need to know about! This timeless classic will bring an air of sophistication to your wedding day and ensure your wedding photos stand the test of time. It’s been a consistent favorite on the red carpet for years and will get a sleek back style to last you into the evening. Opt for a tostled and romantic half up/half down wedding day do. It’s a winner for every face shape and lets you keep the hair off the face while displacing a mane of flowing curls from the back. If you are looking to go beautifully bohemian on your big day, let it all flow with mermaid-esque waves. It’s a laid back and low maintenance style that can be easily achieved with a spritz of salt spray and a scrunching of your locks. Add a subtle flower crown to tie it all together and you’re set! Go glam with a full-bodied ponytail. If you aren’t one for having your hair all up in your face then this one’s for you – backcomb to give the hair texture then add a hair jewel or floral accent to keep it bridal. Effortless and elegant, Hollywood curls screen wedding sophistication and would match perfectly with a silk gown and red lip. Glam it up with a sparkly headpiece. Plaits give a great foundation for any bridal hairstyle. Whether it’s a composition of french plaits, dutch braids, hair twists or mini sections it will no doubt be a stunner of a style. Why not embrace old-school glamour with a retro inspired wedding hairstyle? Channel your inner pin-up with a 50s style victory roll to the front of the hair and a pin-curled back. A bridal bun can create a minimalist and modern look that will wow! 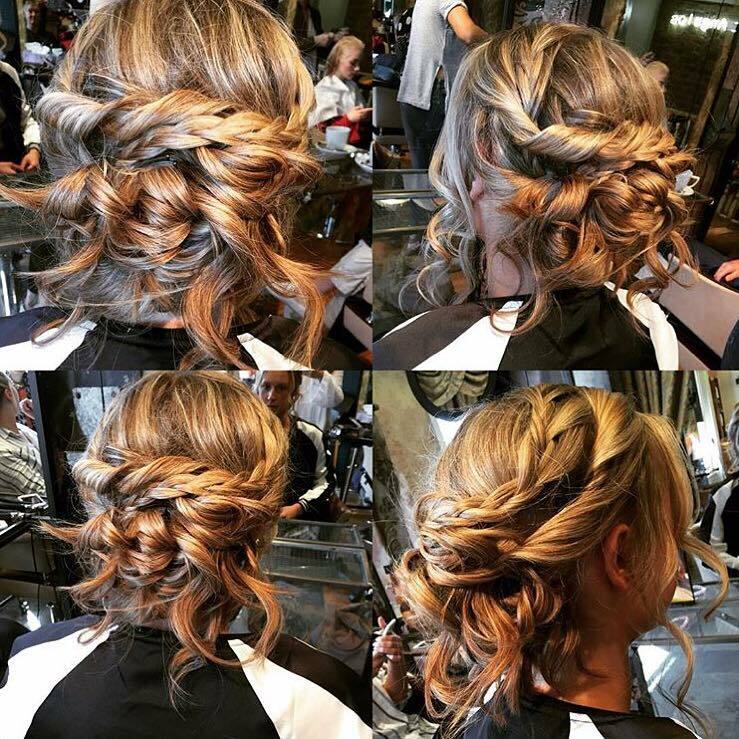 Depending on how to style it, a bun can be adapted to be in keeping with any wedding theme from formal to beachy. The halo braid has been all the rage as of late and can adapt well to form a cute bridal look. Be sure to keep loose and piecey with plenty of strands of hair to frame the face. If you are a bride looking for a more quirky and cool bridal style, mix it up with a vintage vibe and add finger waves to the hair. This ultimate Great Gatsby glam will set hearts racing. Whether you’re still stumped for ideas or feel like this has finally helped you find the style for you, check out the full list of bridal services or contact ustoday to book in for your bridal hair rehearsal! We look forward to hearing from you!